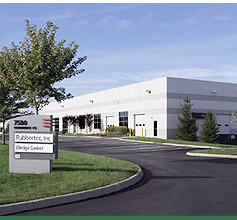 Rubbertec's Distributor Products Division provides an extensive product mix to a diverse customer base. Product lines include industrial and hydraulic hose, tubing, ducting, clamps and fittings, tank truck products, paint spray equipment, matting and loading dock products. As an ISO 9001:2015 certified company, Rubbertec has the systems in place to manage your procurement requirements efficiently and effectively. Our goal is simple. Provide our customers with the finest products, on time, with zero defects. The associates at Rubbertec are committed to 100% customer satisfaction. We are confident that once you experience the service, expertise, and overall value, you too will become a regular customer. Rubbertec stocks a variety of multi purpose / suction and discharge styles of hose. Thse include air and water, Jackhammer, washdown, synthetic mill, contractors "bull hose" and paint hose. Many of these hoses can be purchased in bulk or cut lengths. Assemblies are also readily available with many fitting options. Material handling hose is used for a wide range of industrial applications. These include hot air transfer, dry material transfer, pellet and sandblast. A variety of tube compounds are available to meet the most abrasive applications. Hose designed for steam service must always be assembled with fittings designated for steam service. In most applications ground joint "Boss" fittings having a two or four bolt design are recommended. These fittings also make it possible for field assembly. In addition, Rubbertec offers a new crimp style fitting for customers that prefer a low profile design for plant use. Call Rubbertec technical sales at 740.657.3345 for additional information and recommendations. Rubbertec serves the food industry with dry and liquid transfer hoses. Along with a variety of lightweight and flexible hose styles, Rubbertec can attach stainless sanitary style Tri-Clover fittings. This is accomplished by internally expanding the fitting to the hose tube which prevents the build-up of material. Call Rubbertec technical sales. We will be happy to review the options available. Rubbertec provides a variety of petroleum hoses designed for full suction as well as discharge service. New manufacturing methods have enabled the production of lightweight, flexible and kink resistant petroleum hoses designed to provide ease of transfer and operator safety. Call Rubbertec technical sales to discuss the new bio-fuel hoses which prevent the degradation of cover materials caused by the permeation of bio-fuels. When it comes to chemical hose, safety and proper installation of fittings is imperative. That is why Rubbertec recommends swaging, testing and tagging of chemical hose assemblies. Our hose technicians are thoroughly trained to correctly fabricate chemical hose assemblies to industry standards. Adherence to strict procedures ensures proper retention of couplings and safety for all those concerned. Not sure which chemical hose and fittings to use? Call Rubbertec's technical sales, we have the experience to answer your questions and concerns. Composite hose is specifically designed for use with today's wide range of chemicals. Chemical resistance is achieved by using seamless polypropylene tubes along with multiple wraps of plastic film. The hose body is reinforced with high-strength materials and is supported by an internal and external spiraled wire. If your application calls for a tough and extremely flexible transfer hose, try composite style hose. Rubbertec technical sales can assist with explaining the different wire materials and end fittings suitable for your application. Rubbertec offers Teflon lined stainless braid hose assemblies in both smoothbore and convoluted styles. Teflon hose has been developed specifically for customer requirements that demand flexibility, high temperature and resistance to the broadest range of chemicals. Along with Teflon hose, Rubbertec provides corrugated metal hose for the industrial and bulk hauler markets. Applications include railcar offloading, unloading grains and plastic pellets and transfer of hot materials.